Confession #1: I hate concerts. A compilation of country musicians singing exclusively patriotic ballads or break up songs. So yes, I just mean that I hate most concerts. I realize this is ultimately a personality flaw, something that makes me decidedly less cool than my hipster concert going counterpoints. I used to pretend, to put on lipgloss and pretend to be psyched as Mindy Kaling would say, but I’m over that now. I just don’t like concerts. I would pick any dinner party, any TV marathon, any ballet or opera or musical or quiet night at home in pjs drinking herbal tea over a concert. Sorry y’all, this isn’t one of those cool blogs where I go to indie concerts and wear ironic t-shirts. But back when I tried to hide this distaste, I went to a giant Christian music festival near our house every year. And I enjoyed it all — except the concerts. The funnel cakes, the wearing t-shirts advertising free hugs (because yes, that was a Thing), the card games in camp sites — I loved it all. Luckily for me, almost every year I was in high school the festival was plagued by terrible weather. Horrible storms would inevitably drive even the most diehard concert goers from the grounds to my parent’s house where we would sit cozy by the fire and have good conversation. Basically, I won. And one time, my mom made chili for us poor concert refugees. Perfect, spicy, non-fancy, hearty, tomato-y chili. The type that warms the body and the soul and can be made with the ingredients that you always keep on hand. Confession #2: We turned on the heat this week. We wanted to make it till Thanksgiving, but after James tried sleeping in the giant gloves he would wear when he worked in an ice cream factory, we decided to cave. In the weeks leading up to this decision, we just made lots and lots of chili. James got sick a couple weeks ago and wanted chili, and I, having never made it before, just threw things in the pot until it tasted like my mom’s does, capable of driving away cold winds and grey days. Chances are good that a lot of you had to cave and turn on the heat too this week, had to dig the wool socks and hats out of hibernation. This is a chili for that. Some of you might have even seen snow flurries, might have had the first hope of a snow day. This is a chili for that. 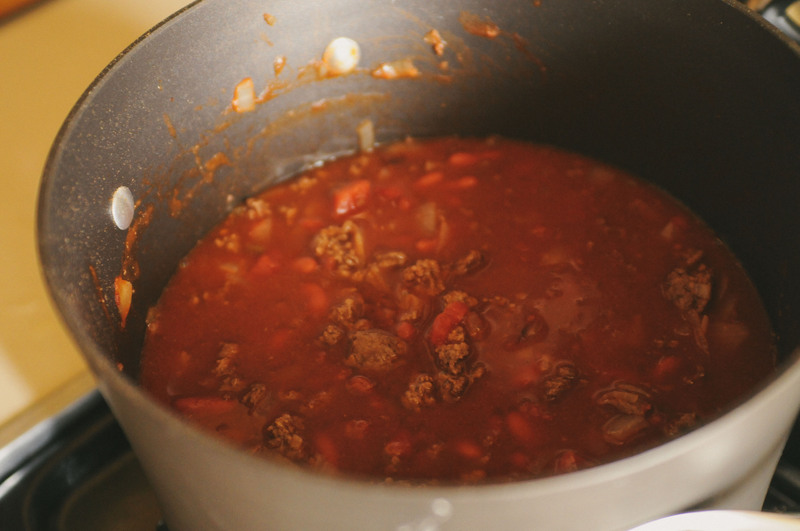 A simple chili with nothing fancy, but still accentuated with a couple dashes of those cozy fall spices. A hearty chili, one that can be a meal all itself. An easy chili, one that can be assembled quickly and then just grows better the longer that leftovers sit in the fridge. A comfort chili, one that everyone will turn to at some point between now and spring. 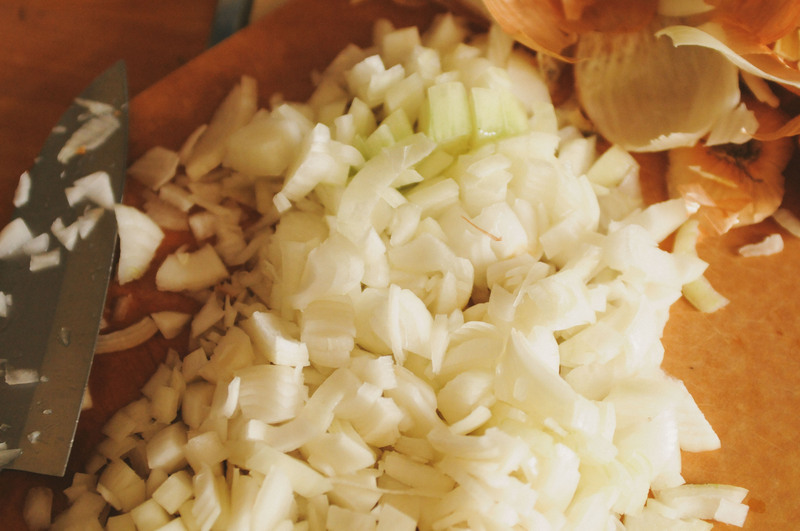 Sauté onions and garlic cloves until soft. 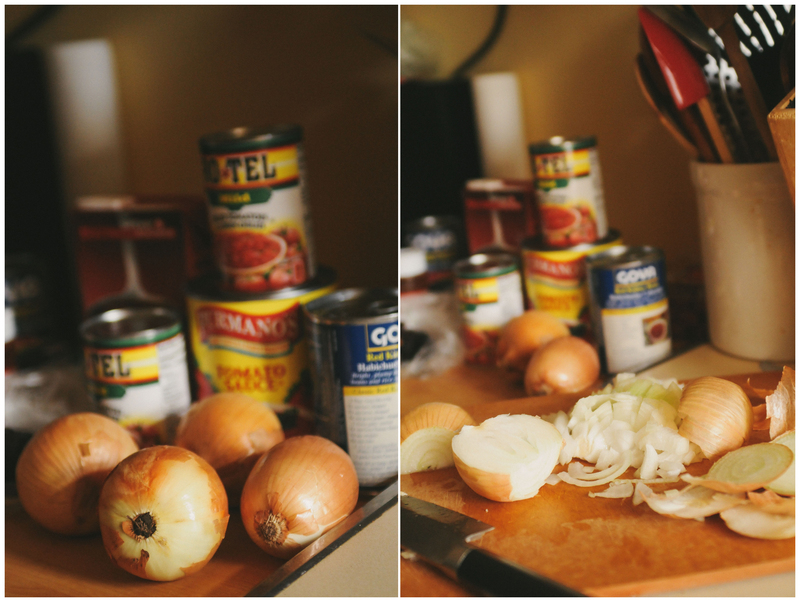 Use as many garlic cloves as you want… I toss in about a tablespoon of the canned ones. Add meat and spices. How much you add is really up to you. I do about 1 tablespoon of each, but you can tweak as needed. Cook 5 minutes. Add tomatoes, sauce, beans, stock and simmer for 20 minutes. Serve with sour cream, cheese, cornbread, etc. Note: In the pictures above I was doubling the recipe. 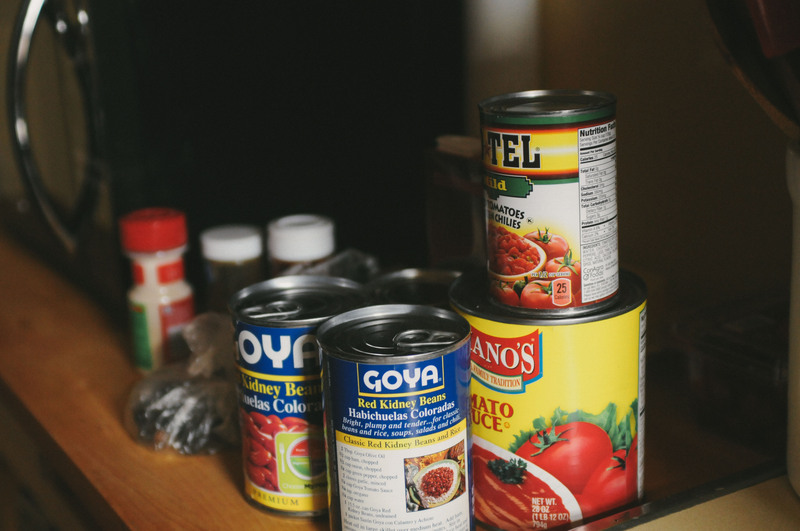 What are some of your favorite cold weather comfort foods? This entry was posted in Uncategorized and tagged Cooking, fall, food, soup. Bookmark the permalink. We are kindred spirits. I refuse to attend concerts with few exceptions, some of which are listed above. Can we please make it a life goal to see Beyonce together? I do think she would be interested in hiring us as ballerinas/besties. LIFE GOAL MADE. She would totally want us and our moves. I remember the one year that I was down for Ichthus and to visit Asbury when I literally had to run from a concert with Ben Longinow to escape the tornado warning. 🙂 I guess I didn’t realize how frequently this happened! Oh Benny boo-boo… ; ) . It basically happened every year until they moved it to June, and then it was just super hot. Mmm, I’d like some chili for breakfast, please. It looks so warm and cozy. And I don’t care for concerts much either. Too loud, too crowded, and usually either too cold or too hot, depending on the time of year.